They stand like alabaster sentinels at almost 7,000 feet overlooking some of the 2.7 million acres of the Tohono O’odham Reservation in southern Arizona. They are the 22 optical telescopes and two radio telescopes of Kitt Peak National Observatory — windows to places in the firmament that we can barely imagine. Consider: This largest collection of telescopes in the Northern Hemisphere can see and photograph the 250 billion (more or less) stars in our Milky Way galaxy and perhaps an equal number of galaxies (more or less) in the known universe. These numbers are baffling even to Tim Hrutkay, the observatory’s daytime programs coordinator, who has spent 28 years educating the public about astronomy. That history includes the agreement with the Tohono O’odham Nation (formerly Papago) in the late 1950s that allowed the National Science Foundation “a perpetual lease, as long as the land is used for astronomical study, research and related scientific purposes,” Hrutkay explains. It appears that the foundation has kept its word. There is a modest visitors’ center with an impressive exterior mosaic and instructive interior displays and exhibits, and a small gift shop that offers postcards, celestial gifts and exquisite Tohono O’odham baskets and other artwork. There is no restaurant, but plenty of picnic tables. 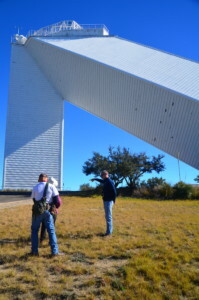 Our first moments are spent gazing at the expansive tribal lands below that encompass the cross-border Sonoran Desert. In the distance is the nation’s sacred peak Baboquivara — a sizable chunk of granite silhouetted against a spotless cerulean sky. The Sonoran Desert’s low humidity also eliminates the occurrence of foggy mirrors in the telescopes, and light pollution here is minimal. 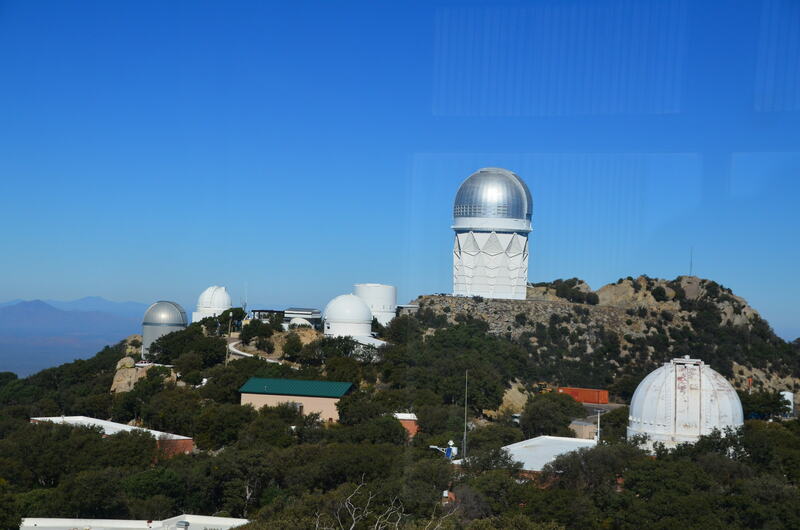 And unlike Palomar Observatory, which is funded by California Institute of Technology, a private institution, Kitt Peak is publicly funded. That means that astrophysicists from many academic institutions can spend time gazing through or gathering information from the observatory’s two dozen telescopes. Some of their findings include the discovery of the first indications of dark matter; detection of water and helium in the sun; a greater understanding of the formation of stars; and the discovery of a void in the constellation Bootes, which led to an early indication of the large-scale structure of the universe. And just to clarify, the heroic days of astronomers spending cold, lonely nights on desolate windswept mountaintops peering through their telescopes are long gone. Scientists now electronically gather their data and store it for later analysis and interpretation. The soon-to-be-operational DESI (Dark Energy Spectrographic Instrument) Program at Kitt Peak will obtain the spectra of approximately 30 billion galaxies and construct a 3D map of the universe over its five-year mission. The amount of data generated by this program alone will keep astronomers and researchers busy for decades. KPNO is 56 miles/90 minute drive west of Tucson. Tours are given year-round, day and night. Visit www.noao.edu/kpvc. For more photos, visit www.facebook.com/elouise.ondash.